Over the Rainbow: A New Design and Giveaway! What a fun giveaway. Would love tow in a seat in this class ... thanks for the chance. Love the light and fresh feel to the blog! Yay for makeovers. lol.. And thanks for the chance to win! Love your new blog design Keshet! It is whimsical and fresh. 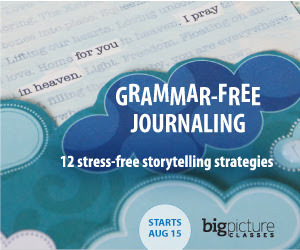 Thanks for the chance to take this BPS course on grammer-free journaling. I could really use some new ideas for my journaling. I would love to take this class! Love the look of the new blog! I can always use help with journaling, thanks for the chance to win! Love your new blog design! I wish I could get back into blogging!